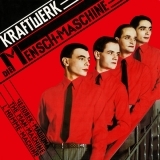 Die Mensch·Maschine [The Man-Machine] (this album) (1978), 3-D (Der Katalog) (2017), The Catalogue (compilation) (2009). Showing latest 5 ratings for this track. | Show all 90 ratings for this track.